Discription:They were practically made in minutes . 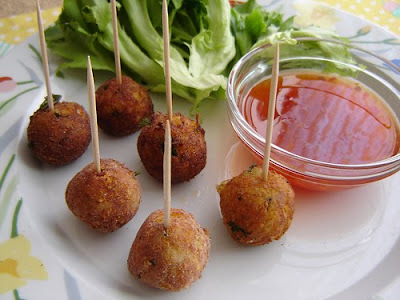 They are a great starter for any party or get together and my friends loved them. So will you!Try it ane Enjoy!! Mix all the above ingredients together (except of course the oil) very well . Make small bite sized balls and keep aside. Serve on cocktail sticks with your favourite dip. You can used Thai Sweet Chilly Sauce.